The end of the world has been imagined in many different ways, particularly after the revival of the zombie genre in recent years. So it's refreshing when a post-apocalyptic story comes along with a fresh concept that hasn't been done to death. In Defender , the world has changed utterly because of voices in people's heads which incite violence, murder and suicide on a massive scale. Pilgrim is a man who misses the old world's creature comforts, but tries not to think too hard about this what he has lost. He hears a voice, known only as Voice, but unlike others' voices it isn't driving him to hurt himself  yet. One thing does do is lead him to Lacey. 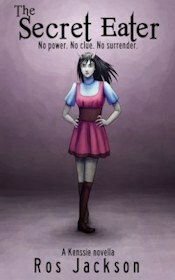 Lacey is a lonely 16-year-old who has lived a sheltered life at her grandmother's house, lately all alone. She wants to see her sister and her niece who live in a city a long way away, but with communications down Lacey has no idea what she'll find when she gets there. The world beyond Lacey's house and garden is shocking. People have stopped trusting each other, so there is no trade, only people taking what they can. And those who have survived in America for the seven years after the voices in people's heads awoke are often nasty or deeply traumatised. It's a grimdark story, with quite extreme violence from very early on which continues in episodes throughout. The young, naive Lacey has no idea of the horrors waiting for her, and neither do readers. There is a relentlessness to this novel's grim tone. Yet the end of the world hasn't been brought about by any of the usual suspects such as plague, nuclear war, natural disaster, or famine. The world is structurally as it was, and the disaster is entirely of people's own making, due to paranoia and despair. As such, it's a great metaphor for our times. Anyone can be the enemy, even people's own families and mostly people's own minds, but at the same time nobody is an enemy. Everyone is a victim. It seems as though the voices spread almost like a meme, but the exact mechanics of it aren't fully explained and the main breakdown of society happened in the past and isn't shown in this book, which is a shame. The story is action packed and highly suspenseful, as well as consistently gory. Although an attachment grows between the main characters, it's definitely a familial kind of bond. However, not only is there no romance, this story is almost an anti-romance in its cynicism. Voice offers up black humour in its commentary of Pilgrim's life and his choices, which sometimes sweetens the overall bleakness. Lacey's hopeful outlook is another aspect that makes the narrative engaging in spite of its darkness. The ending arrives in a climax of blood and fury. 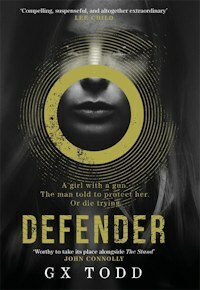 However, there is a sense that although there is closure for part of the story, Defender is setting the scene for a much more epic narrative to come. The concept is intriguing, and I love the contrast between Pilgrim's cagey cynicism and Lacey's energetic optimism. This novel resonates with the current era's atmosphere of distrust and fear, and it does so with a gripping narrative that I found horrific, charming, and accomplished. A Cessna pilot searches for human connection at the end of the world, but when survival is at stake the normal rules of civilisation fall by the wayside.